Last weekend we participated at secuinside ctf. Mainly there were 7 binary and 7 web challenges besides a few other. All web challenges were really fun and according to the stats SQLgeek was one of the hardest web challenges. For all other web challenges there are already writeups, so here is one for sqlgeek. The source code of the PHP application was given and the challenge required 3 tasks. PHP’s magic_quotes_gpc was enabled. First I looked at the given source code without playing with the complicated application. Line 409 and following was eye-catching because some SQL filtering was going on. Even more interesting was line 411, where the input GET parameter view was converted to a korean charset before embedding it into the SQL query in line 418. This leads to a SQL injection. Chris shiflett, kuza55 and others published a bypass of the escaping in MySQL several years ago abusing uncommon charsets. Summarized, if you supply the character sequence %bf%27 it will be escaped (due to the PHP setting magic_quotes_gpc=on) to %bf%5c%27 (%bf\’) and by converting this to the charset euc-kr the valid multibyte %bf%5c in this charset will be converted to one korean symbol leaving the trailing single quote %27 unescaped. Now first of all the same session is shared between the index.php and the ReADDDDDDD______MEEEEEEEEEEEEE.php. PHP sessions are stored in session files in a path that is configured with the session.save_path setting, likely the path that is prefixed in line 9. The name of the file consists of a prefix (normally sess_) and a value (normally md5) that is submitted by the cookie parameter PHPSESSID. In this file, the values of the global $_SESSION array are stored serialized. By altering the cookie one can create arbitrary session files (within a alphanumerical charset). However, this does not set the $_SESSION array key PHPSESSID to the same value. Finally we can see that the flag is in line 2 (in the source file replaced with ????). So first I simply tried to read the original passwordddddddddddddddd.php file that must contain the real flag. But this would have been to easy 😉 The readme/ppppaassssswordddd.txt also did not already exist. A very nice challenge with several steps, thank you to the author! BECHED noticed in the comments that you could also do a HTTP HEAD request to the passwordddddddddddddddd.php script which will parse the PHP script only until the first output, thus not deleting the flag file. You can find more details about this behaviour here. Secret Space Code (SSC) was another web challenge I prepared for the hack.lu 2011 conference CTF. Because we experienced that web challenges are one of the most solved challenge categories during the last CTFs we participated and organized we decided to provide some tough ones. hint: Client-side challenges are error-prone. Practice your attack locally before sending a link to the SSC admin via private message. After we got some metasploit tainted links we added the hint that “client-side” was referred to vulnerabilities like CSRF and XSS and not to client-side stack smashing 😉 Otherwise the challenge would not have been filed under the category web. The source code shows that after providing the right password the admin is logged in by session and gets a list of all captains and their codes. He also has the option to search for a specific captain and to order the list by GET parameter o ascending or descending. However there is no SQLi or XSS vulnerability. Everything is escaped and encoded correctly. The password was a 32 character long string and could not be guessed or bruteforced. That is possible because we only need braces that are not encoded by htmlspecialchars() and similar functions. Note that this means that every webapp is vulnerable to this attack as long as braces are not explicitly encoded. That is possible due to the lax IE8 CSS parsing. The first two braces make sure that every HTML content before our CSS is treated as (broken) CSS. Then our CSS starts where we define everything that follows in the HTML output as the body font-family. Because the IE8 parser will not find an ending brace it will include everything to the font-family until the end of file is reached. We also set a timeout in case loading the remote site as CSS resource takes some time. The code for captain Cardboard was F15-F29-F32-F65-F17-F22. For more information about this attack read scarybeasts blogpost or this paper. Note that this can only be reproduced with an unpatched IE8. Alternatively you can add the prepared HTML page to your trusted zone which will bypass the patch. As almost expected nobody solved this challenge most likely because the attack has not got much attention. However knowing that it is IE8 specific one could have looked at the recent IE8 patches. Also SSC is backwards for CSS and could have got you in the right direction (scarybeasts blogpost is the second hit when googling “IE8 css security”). Thanks to .mario for bringing this vuln to my attention. As last year our CTF team FluxFingers organized the hack.lu conference CTF. Again the CTF was open to participants all over the world. As last year I prepared some web challenges designed in this years topic “space”. 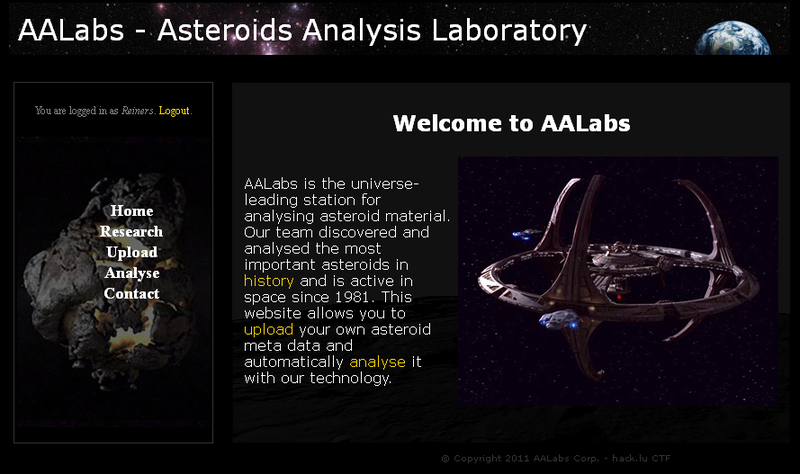 The challenge AALabs was about a website of a Asteroid Analysis Laboratory where you could create an account and upload asteroid meta data files for analysis. 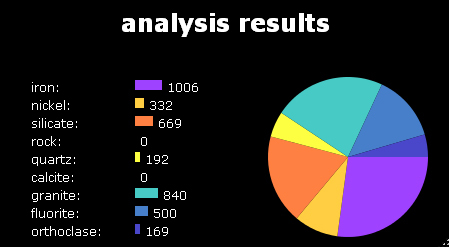 As a result a graph was shown to the user that summerized the amount of different material detected in that asteroid. You have stolen the administrators password hashes from AALabs – a profitable technology center in outer space. However you were not able to crack them yet. Can you find out the salt? Similar to last years web challenge you had to use different techniques to get the salt. At first you had to create an account with a unique username, your password and several other info about yourself. The AALabs webapp then internally created the new directory /home/files/username/ to later upload your files to a unique directory. Also the webapp added the user to the database for authentication and file authorization. After registration you could login and upload your asteroid meta files. Once successfully uploaded, your file was listed in the analysis table with the option to delete the file and to create an analysis report. Obviously the file name was escaped correctly when INSERTed into the table of uploaded files. However when creating a report and saving the new report file name (that includes the original file name) the name was not escaped correctly and the error was triggered during the UPDATE statement. The trick here was to closely look at this error message before trying to exploit the SQL injection. It reveals the behavior that has been described above: the webapp operates with a directory that includes your username. Since it generates your report files in /home/files/username/ with your uploaded file name and the appended .report extension, it is very likely that it also uploads your file to the same directory /home/files/username/. That is safe at the first glance because the directory /home/files/ can not be accessed via webserver and many teams continued to investigate the SQL injection. However the SQL injection itself was a dead end because important characters like parenthesis were filtered. The SQL injection was actually a Information Leakage. Now that you gained access to AALabs it is time to do some further digging to get into their system. However they seem to have a pretty safe configuration running on their webserver. Can you get around it and read the Flag? A writeup will follow for this task. Unfortunetely only one team (props to bobsleigh) managed to solve the first task. I don’t think that the first task was too hard, however there were two distractions. First of all the SQL error was mostly pointing the teams to a SQL injection filter evasion challenge rather than a simple information leakage. Secondly the path traversal had to exactly point to the webdirectory because the www-data user had only write access to /home/files/ and to /var/www/. I can imagine that some teams tried to traverse only one directory up to see if path traversal is possible but stopped trying after not successfully writing to /home/. This week we organized the Capture-The-Flag contest for the hack.lu conference in Luxembourg. It was open to local and remote participating teams and played by nearly 60 teams. My task was to write the scoreboard and some web challenges. The big topic was “pirates”. Everything is mirrored at http://hacklu.fluxfingers.net/ where you can find lots of other cool challenges and writeups. 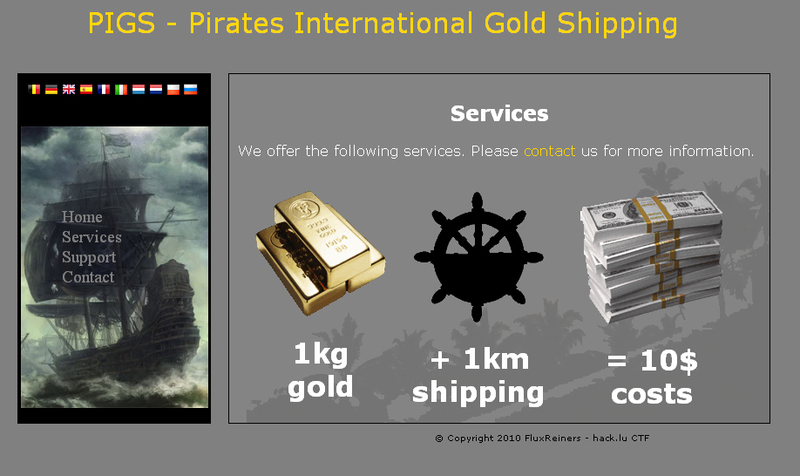 In challenge 21 the players were given a website of a criminal pirate organization stealing gold. The task was to hack the website and to find out, how much gold the leader ‘Jack’ has stolen so far. Our website supports 10 international languages (automatically detected) and we are always looking for help to support new languages. If you are interested, please contact us for more information and to receive the key for signing your language file. Also 10 different flags on top of the site menu show which languages are supported. How are those languages detected automatically? By the Accept-Language-header your browser sends automatically. You can verify this by sending different header values (I prefer using Live HTTP Headers). In example Accept-Language: es will show the website with spanish text. Language (foobar) not available. Switching to default (en). Language (index.php) not available. Switching to default (en). Sweet, the error reveals the source code. Now we can download all files that are included and analyse the source code. The source code reveals, that there is a hidden ?id=17 displaying the admin login interface. Behind this interface the current gold status of the logged in captain is shown. The task is to find out captain Jack’s gold status so we need to login as ‘Jack’. Lets see how we can accomplish that. The file worker/funcs.php reveals how the language files work. Basically all language data is stored serialized in files. Those language files are stored in messages/. Each language file also has to have the serialized variable $secretkey set to “p1r4t3s.k1lly0u” to pass the check if the file is signed. Then, all data is unserialized and assigned to the global array $messages which will be used to display the text throughout the website. However we can not directly browse to messages/ because we get a 403 forbidden for this path. Uploading a signed php file with php code (php shell) within the serialized strings will not work here. Investigating the object-oriented code in worker/mysql.php shows how the database queries and connection is handled. For each request to the PIGS website a new class object sql_db is created. This object is initialized with the reserved function __wakeup() and later destroyed with the reserved function __destruct(). One can see that when the function __destruct() is triggered, the function sql_close() is called. On the first look this looks unsuspicious. However when looking at the function sql_close() we see that a log event is initiated. So every request will be logged into the table that the current sql_db object has been initialized with (logs) during the constructor call sql_db(). The inserted values are all escaped correctly, so no SQL injection here. Or maybe there is? The function __destruct() of every instanced object is called once the php interpreter has finished parsing a requested php file. In PIGS for every request an object of sql_db is created and after the php file has been parsed the __destruct() function is called automatically. Then, the function sql_close() is called which calls the function createLog(). When uploading a language file that contains a serialized sql_db object this object will be awaken and lives until the rest of the php code is parsed. When the createLog() function is called for this object within the __destruct() call, the locale variable log_table is used in the sql query that creates the logentry. Because this locale variable can be altered in the serialized string uploaded with the file, SQL injection is possible. which will insert the specified values into the table users. The table name is escaped before used in the query, however a table name is never surrounded by quotes so that an injection is still possible. We simply avoid quotes with the mysql hex representation of strings. To build the serialized string we can instantiate a modified sql_db object ourselves and serialize it. The mysql connection credentials can be read from the leaked source code files. Now we can simply save the serialized payload into a file and upload it. The language file will successfully pass the key-check and the language data will be unserialized. Then the sql_db object will be created with the modified log_table variable. Finally the __destruct() function is called automatically and the log_table will be used during the createLog() function which triggers the SQL injection and the INSERT of a new user ‘Jack’. Now we can login into the admin interface with our user ‘Jack’ and the password ‘bla’. Then the function printGold() is called for the username that has been used during the successful login. This code will wait for something passed on port 3333 and then execute the rest of it. So we connect to port 3333, enter /bin/bash and will finally get a remote shell. As we figured out afterwards this was a fairly stupid workaround for just using nc -l -p 2222 -e `which bash`, but was plain fun anyway during the contest. Interesting to note is also that backticks on commandline work in double quotes, but not in single quotes. You are currently browsing the archives for the CTF category.